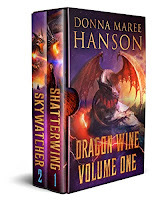 It's hard to believe it's been more than two and a half years since I first reviewed Shatterwing and Skywatcher, the first two novels in the Dragon Wine series by Donna Maree Hanson. The pair of dark and fantastic tales drove the plot of the first right into the second and have been dressed up into a single volume (in addition to stand alone titles) with gorgeous new covers that brilliantly reflect their grim and gritty nature. While the ending contained a satisfying amount of flame and fighting, enough remained to leave me wondering where the tale might go so I was excited when I heard she had four more novels planned. I recently read Deathwings, book three, and am very pleased it holds up well both in its continuity of the plot of the first two and in the way in which it remains true to the original world building and treasures the nature of the characters we continue to follow. Deathwings picks up in the rubble and carnage following the ending of Skywatcher. Hanson winds the characters up with a heavy mix of personal failures and desperate goals then sends them off on their interconnected trials. 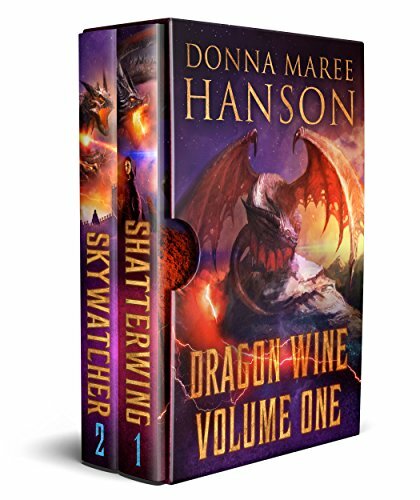 Even though it has been so long since I read Shatterwing and Skywatcher, I reconnected quickly with the characters and fell into the story and setting. My favourite character thus far is Nils, a time-traveller of sorts who woke after a thousand year sleep to find himself the only living person in his vast underground city. He is always portrayed as isolated and alone, pale, invisible and even hiding in the shadows. Even his name, Nils, (I associate it with nil, or nothing) enhances the idea of him being on the outside. Ironically and in spite of Nils and his lost society existing on the outskirts of the surface dwelling Margran society, he may be keeper of the only clues that may save the surface dwellers from their falling moon. It's also hard to describe these books without using words like grim and dark over and over. 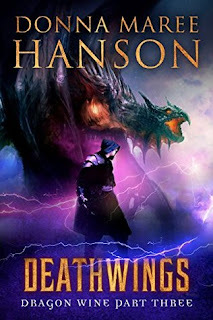 Deathwings is written with an incredible economy of words in that people, places and even thoughts have been described in a way that maximizes the impact of Hanson's words. 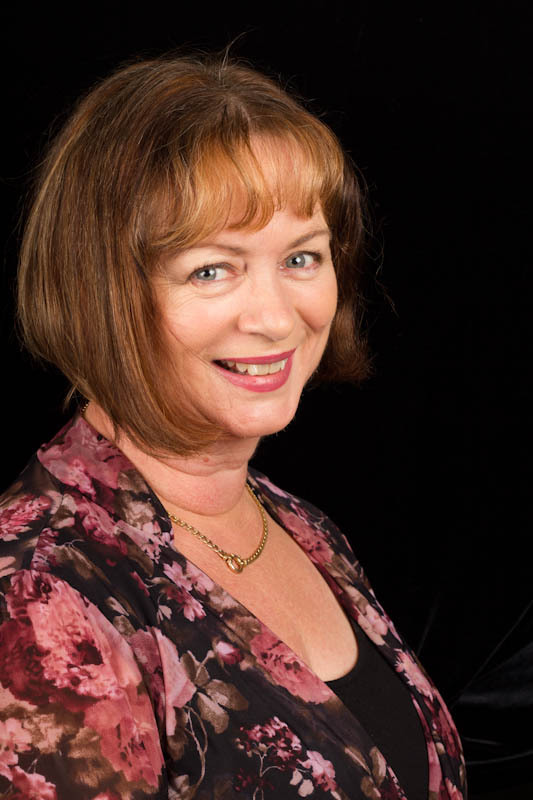 She shares the ugly and the beautiful with a deft hand for quickly creating memorable imagery. Having read much of Hanson's work, Deathwings is the most powerfully written tale I've experienced from her yet. Her words build tension and power the action. Not once did I find a distracting choice of word or 'dropped in' patch of back story to bump me from my engagement. As a middle book in a series of six, Deathwings secures its place as the plot anchor both wrapping up the first half and setting up the volumes yet to come. It's such a great feeling to be in the middle of a series you love and know you still have three full stories to read for the first time. I look forward to more adventure and recommend you fill out your fantasy collection with this quintet.